the kitchen table blog: RUNNING THE ROCKPILE: Two opportunities to watch! I've got two viewing opportunities for you this Fall, already! On Sept 12 the Howe Library in Hanover, NH will be screening RTR as a part of the Inspire Active Living Series brought to you by Upper Valley Running Club member and New London Recreation Director Chad Denning (of Team Amp). Many thanks to Nancy Dunbar, also, for her help organizing this event. Along with the screening, members of the UVRC will be in attendance to talk about their experiences with the race. The night promises to be a great resource for not only mountain running enthusiasts interested in the big hill, but also for those interested in New Hampshire and race history. Very cool event series here. Great ideas on how to get active--maybe there are more folks out there like me who had no idea there even was such a thing as mountain running. And all of a sudden: a whole new challenge. If Hanover is a little out of your way and you won't be able to make that screening, I've got great news for you. Last month this filmmaker was approached by the folks at NewEnglandFilm.com to be a part of their 4th Annual Online Film Festival. To say I was surprised and humbled by this invitation is an understatement. NewEnglandFilm.com is a really great resource for filmmakers in New England, and I suspect even farther afield. I used the website while making my film for tips, techniques and advice on a whole array of filmmaking topics. The site also maintains a job posting board that, for anyone in the film scene--or trying to break into it-- proves a great way to stay connected to New England opportunities. I was pumped to be able to submit Running The Rockpile to this festival. 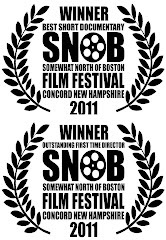 Big Shout Outs to the SNOB (Somewhat North of Boston) Festival for nominating RTR for this honor! Thanks, again, to all those followers who've waited patiently to see the film up online. Don't miss your chance to see it!